Karin Jaggi started windsurfing in the Alps in the late 80s. She was cruising on lakes and probably would have never thought to win almost 30 world champion titles in windsurfing. She started to compete on the World Tour in 1993, made a living out of the sport, won a lot of competitions and national or international titles and is nowadays one of the most successful windsurfers. Not only did Karin participate in hundreds of events, she tought a lot of students the modern way of windsurfing, tested boards, studied business economics on the university of Hagen, set new speed records and started a new windsurfing board brand together with Patrik Diethelm. 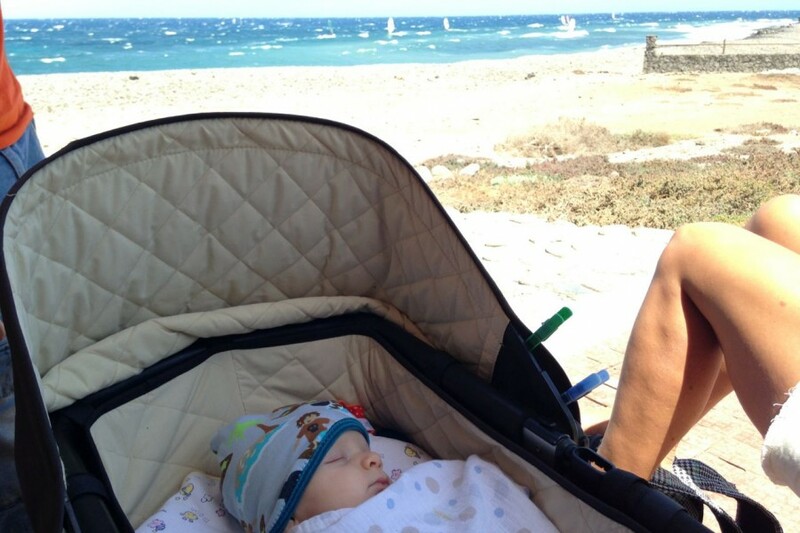 In 2014 Karin gave birth to Levin, who is already travelling around with his busy parents. 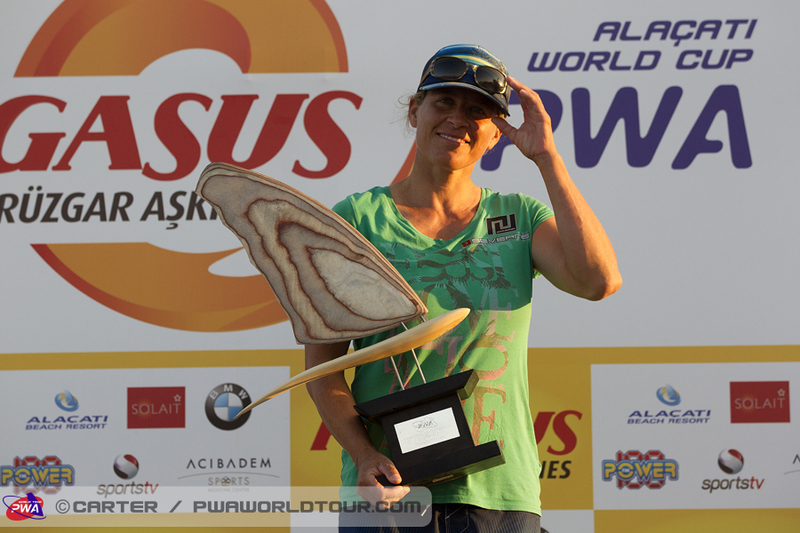 Karin, born in 1971, will have less time to compete and will retire from participating at the whole PWA tour. Karin is back in shape after the baby break and together with her new sail sponsor Sailloft Hamburg she will be seen at selected events, but will not continue the career as usual as her time is more and more limited due to family affairs and the intense work for the own brand PATRIK. Karin can look back on an exciting time as a professional windsurfer and we wanted to hear more about the past and her decision to stop doing the tour. 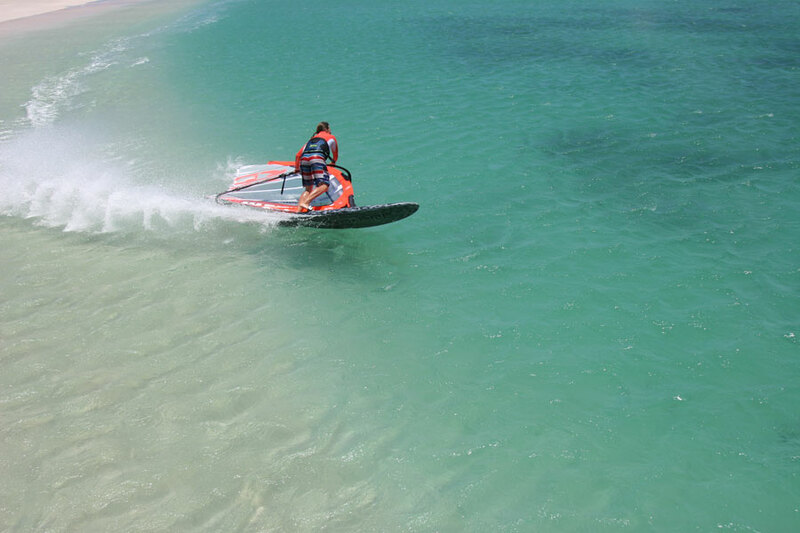 Continentseven: Your last PWA event was the Slalom in Alacati in 2013. Do you plan a come back as an active competitor after the birth of your son last year? Or will you fully focus on family and your business. Karin Jaggi: Basically I would love to come back, but it’s not very likely because the day only has 24 hours and with Levin (e.n. first son of Karin Jaggi and Patrik Diethelm) and the business I have to be happy if I get some time on the water right now. As always in life it’s a free choice – one I definitely don’t regret. I did the PWA tour for over 20 years! Turned world champion 29 times. Travelled around the world endlessly – and actually still continue this part. So even if I somehow still would love to fully compete again I don’t feel at all that I miss out on something. Continentseven: We saw a few pictures of you windsurfing with the latest racing sails from Sailloft Hamburg? You changed to their team for 2015? Will we see you at a Slalom event in 2015? Karin Jaggi: The sails are registered. Gerrit from Sailloft is promoting our PATRIK boards since 5 years in Northern Germany. He has always asked me if I could not imagine to change to Sailloft. But because racing was important for me and Sailloft had no slalom sails this was impossible so far. A part from that I was super happy with my Severne sails in the last years. Now Sailloft finally made the step and started with slalom sails and at the same time I kind of was contract free. So yes I started using those sails and believe they are really good. Yes – they are registered for PWA racing and I am sure soon or later somebody will use them at an event but it most probably won’t be me – just because I don’t plan to compete on the tour anymore. I know Olaf Hamelmann and Gerrit Maaß since several years due to the partnership with our brand PATRIK boards. When they told me to develop a slalom sail and that I could be part of it I found that very interesting and challenging. The reliable and direct collaboration within a small team are the optimal basis for fast and efficient development. Continentseven: How hard is it to retire from the competition scene as an active competitor, after so many years of competing, traveling around, having no real home base? Karin Jaggi: Not hard at all – because basically not much has changed in my life apart from the fact that I don’t compete anymore. I still went to quite a few events and Levin is already a true world traveller with just 13 months. And I have not completely stopped – I just can’t see myself doing the full PWA tour anymore. Continentseven: Was it the right moment to say, good-bye? Karin Jaggi: Right moments don’t just come along – you have to make them right. In my experience you just have to do it and then make the best out of the situation. I am very happy with my current moment – that’s for sure! Continentseven: What will you miss most? Karin Jaggi: The competition. What many other sailors always fear – the challenge, the pressure before a heat, the adrenalin when things go wrong and you have to make it up. I loved it! Always did. Probably my secret of being as successful as I was. Continentseven: What will you definitely not miss? 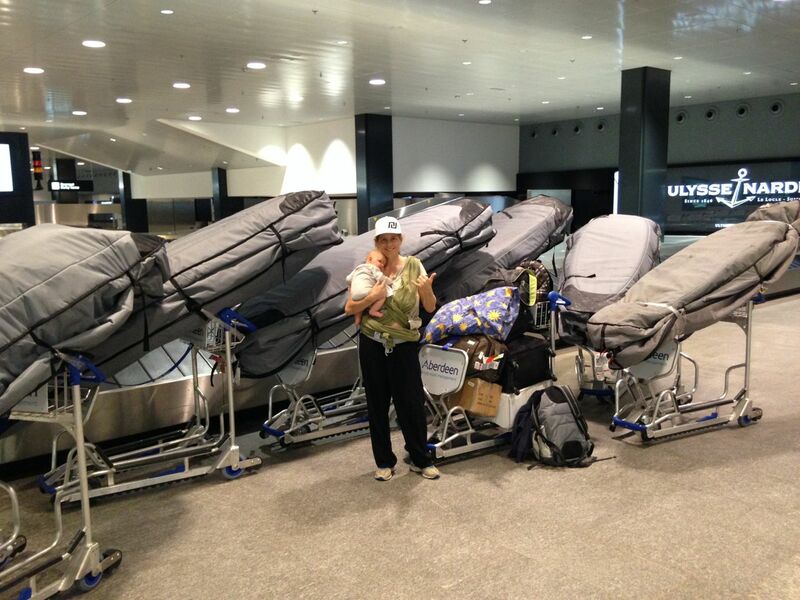 Karin Jaggi: I would love to say carrying the gear around and all the discussions with airline employees at the check-in. But in reality this part has not changed for me at all: I carried just as many board bags around the globe last year than I have ever done during my career. Continentseven: What was your biggest success in your career? Continentseven: Which discipline did you like most? Karin Jaggi: None. Or better all. What sense it makes to go sail waves in flat water? And why you want to sit on the beach if the wind is offshore? There is a day and a time for every discipline – and I really enjoyed it all. It was always more about my limit – if I would get to my personal limit of what I could do it was a good day/race. Naturally if I could choose the conditions: then I would live in Margaret River, Western Australia where every second day the wave is over mast high and the only sail I need is 4.5m. Continentseven: You are born in the mountains in Switzerland and you made it all the way to the sea. 1988 you got fully hooked and then you started your World Cup career. Do still remember the moment you got hooked to windsurfing? Karin Jaggi: The very first time I tried it. We got some gear at my home lake and my brothers and me took turns to try it out. My cousin showed me a few tricks and I could see how he was able to get planning. And it just fascinated me. Right there – on the first day. And the fascination has never stopped. 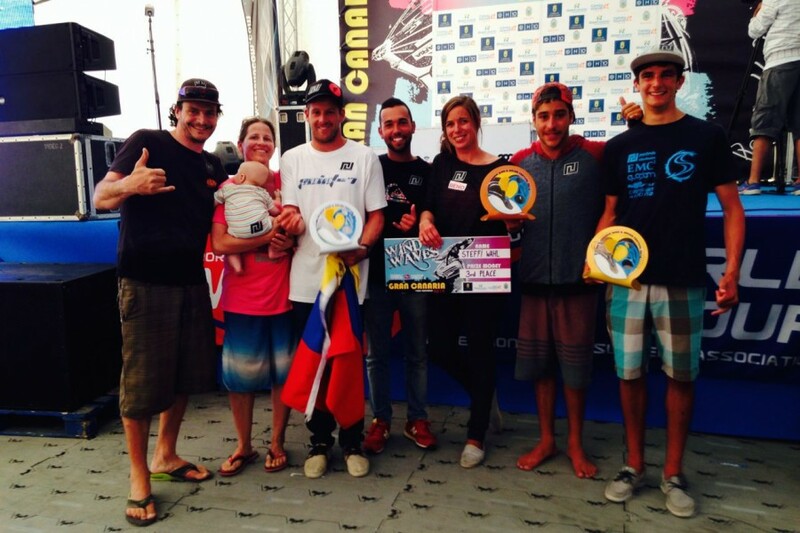 Continentseven: When and where did you participate in your first competition in windsurfing? Karin Jaggi: My first ever windsurfing competition was the Engadin Marathon in 1990. I had to use a dagger board – something I never used before. My result was accordingly. But I liked the atmosphere and wanted to show that I can do better on short boards in the future. Continentseven: And you definitely did better. You won 29 titles in PWA, IFCA and ISA, you were competing in all possible disciplines except the Olympic Class, you made it in all magazines and you smiled from a lot of magazine covers. One question, which probably interests the young, up-and-coming competitors. Did you earn enough money during your career? Karin Jaggi: I was able to live from the sport. But not only by competing. In the beginning I worked as an instructor. Then I managed a school. Then I organised my own windsurfing courses. Finally got enough sponsors to live and compete quite comfortable for a few years (all outside of windsurfing industry sponsors) and then started to work for F2 and finally founded our own company. At no moment in my career I could have lived just from windsurfing industry support. Never. That’s the mistake many young sailor make: they think the industry is rich but tight. It’s the opposite – most of the industry wouldn’t even be there anymore if the brands were run by true business men or women. Continentseven: Do you recommend a young motivated talented windsurfer to start a professional windsurfing career nowadays? Karin Jaggi: Sure. You just have to be aware that most probably it will be hard to live just from sponsors and getting rich is not an option. But that is the same in most sports. On the other hand it’s a great life, an incredible sport that will bring you to beautiful places and amazing people. Karin Jaggi: For that I did it over 20 years actually not that much. I started after the big windsurfing boom, the industry already had a hard time, everybody complained about the lack of sponsors, the girls were always regarded as a bit less worth… Sure windsurfing got smaller, the price money less, sponsors even rarer and the industry is not really capable to even support the first few men anymore. But there is always a choice, a way to do it. 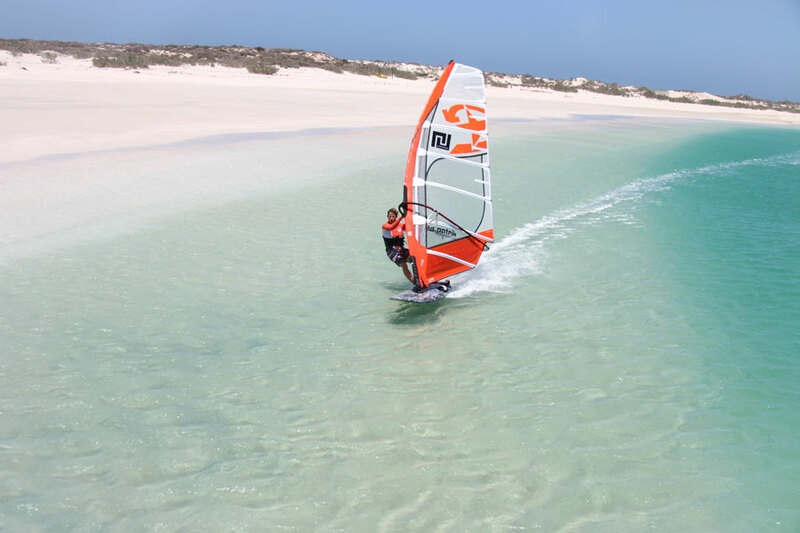 The main and most important factor in windsurfing has remained exactly the same during my whole career – the love of windsurfing – people are in this sport because they want to do it and can not imagine anything else. 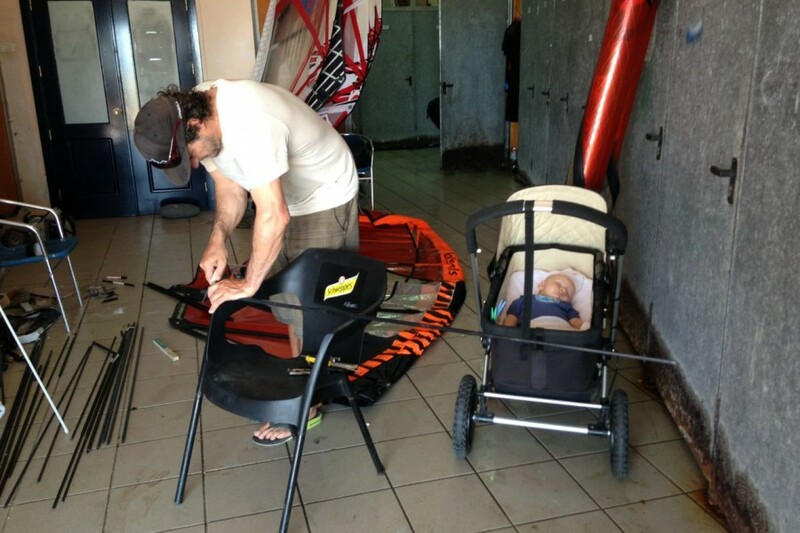 Continentseven: During your professional windsurfing career as an athlete you met a lot of people around the world. Are there any people, who inspired you? Karin Jaggi: Sure – many. With probably a bigger influence at the beginning of my career. The women I admired the most was Jessica Crisp. For me she was the perfect big wave rider. Now she is on our PATRIK boards and told me I am crazy to sail big days in Margies! Another person that I really liked a lot and sure got a lot inspired from is Dave White. Unfortunately I don’t see him that much anymore, but I can be sure he would not have changed at all. Continentseven: We know, you and Patrik run the company Patrik pretty much alone. How hard is it to handle the business and the family? Continentseven: You are living in Western Australia, where some of the world’s best wave spots for windsurfing are located. Is that your dream place for living or do you miss Switzerland and Lake Garda sometimes? Karin Jaggi: We have a house in Western Australia, but we are actually still able to live 6 months in Australia and 6 months in Europe. It’s the endless summer and basically suits us perfect. We know we don’t have endless time left like this though so we try to enjoy it even more for now. Continentseven: How did your dream windsurfing day look like in 2005, how does it look like today in 2015 and how will it look like in 2025? Karin Jaggi: In 2005 I answered that I would be somewhere at a remote spot, together with some friends, great wave sailing conditions, sail all day and then enjoy a beer at the sunset. This year we took Levin up all the way to Gnaraloo and twice down south to our favourite 4WD spot. No phone reception, forget about internet, sailed all day with a hand full of friends – ok one of us always had to stay at the beach to watch Levin and camped directly at the beach. Continentseven: Thanks for the interview.